This series will encompass all the full spectrum of the physical and natural sciences that are commonly employed in solving Quaternary problems. 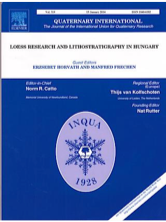 The policy is to publish peer refereed collected research papers from symposia, workshops and meetings sponsored by INQUA's Commissions, Sub-Commissions, Committees and working groups. In addition, other organisations may request publication of their collected works pertaining to the Quaternary. Send to: Elsevier Science Inc., 660 White Plains Road, Tarrytown, NY 10591-5153, U.S.A. and for the remainder world to: Elsevier Science Ltd., The Boulevard, Langford Lane, Kidlington, Oxford5 1GB, U.K.